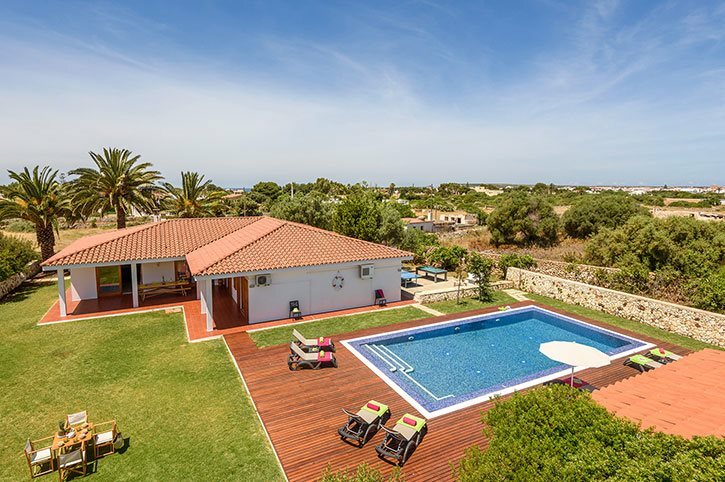 With a large private swimming pool, spacious lawned garden and great location only a few minutes' drive from Ciutadella, Villa Tres Tocs is the ideal choice for your Menorca villa holiday. A choice of shops and eateries as well as a great beach are all within easy reach, without having to compromise any privacy. The local resort of Cala Blanca is also nearby. This charming 4 bedroom villa is furnished to a high standard and includes WiFi and air conditioning/heating in the bedrooms. The large private pool and lawn garden make Villa Tres Tocs a great choice for families! Aside from its well-furnished interior and excellent location, the stand out feature of Villa Tres Tocs has to be its large lawned garden and private pool surrounded by fashionable wood decking. There is plenty of space for children to play, to enjoy a picnic, or simply relax and soak up the sun. There is also a covered exterior dining area as well as chic wicker seating by the pool house, with the brick BBQ to one side of the garden. A track from the street leads to the entrance of Villa Tres Tocs which has a double metal gate opening onto a private parking area and a pathway to the front door. From the entrance hall, the living area is on the right and the bedrooms on the left. The lounge is spacious with ample seating, a large flat screen TV, ornamental fireplace and patio doors opening onto the covered terrace overlooking the pool deck and garden. Adjacent is the fully equipped kitchen and dining area. Large sliding glass doors open into the hallway, opposite patio doors onto the pool terrace. Villa Tres Tocs has 2 twin bedrooms and a double bedroom all sharing the facilities of a separate bathroom and shower room. The second double bedroom has an en suite bathroom. Both bedrooms on the right of the hall also have patio doors onto the garden. Tourist Licence Registration: ET 712 ME. Being equidistant between the island's old capital of Ciutadella and the local resort of Cala Blanca, Villa Tres Tocs is a short drive from both areas where you can find a great selection of shops and places to eat. Ciutadella offers sightseeing opportunities, culture and fantastic shopping facilities as well as a local food market in the centre of the town. The nearest beach is at Sa Caleta, around 5 minutes' drive from the villa. Ciutadella centre has a night market and a wide selection of boutique style shops. Cala Blanca offers souvenir shops and 3 well stocked supermarkets, an internet café and gaming arcade and 4 wheeled pedal carriage hire - a great way to explore the island! Ciutadella Old Town has a huge port lined with restaurants where you can enjoy an evening meal as you watch the sun set over the water. Cala Blanca is around 2½ miles South of Villa Tres Tocs. This popular holiday resort has a couple of hotels, which is where you will find most of the evening entertainment, and an array of bars and restaurants, some overlooking the beach - perfect for a light lunch but also popular when the sun goes down. An array of coves and sandy beaches are dotted along this stretch of coast with the nearest beach being at Sa Caleta, around 5 minutes' drive from the villa. There are 2 waterparks on this side of the island. Aquarock 25 minutes' drive away in Calan Bosch, or the larger Aqua Centre only 15 minutes away in Calan Forcat. Children will also love the popular Lloc de Menorca Zoo close to Alaior, 35 minutes away by car. Within a 30 minute drive is the highest point on Menorca, Monte Toro, which offers panoramic views over the whole island, a gift shop and restaurant plus an opportunity to visit the church atop the hillside. The scenery on the drive up to the peak alone is well worth the journey! Menorca's only golf course is in Son Parc on the North coast of the island, around 40 minutes away by car. Go-karting is available in both Calan Forcat and Calan Bosch is available for children of different ages. Watersports are also available in most resorts, as are a number of other sporting activities such as tennis, horse riding and mini golf. Castillo Menorca along the main road towards Alaior also makes for a great day out with activities and waterslides for the kids and a restaurant and shops for adults, 20 minutes' drive away. Villa Tres Tocs is not available to book for season as it is sold out. Take a look here at the Menorca villas that are currently on sale. The villa was absolutely lovely. It was clean, spacious and had everything that was needed. The pool was fab too - we all loved the holiday and would recommend your company to others. Thank you.